You would think that with the power of the Formax 8600CC Cross-Cut Office Paper Shredder that it had a gas tank and a pull string starter. They opted instead to simply plug it into the wall. 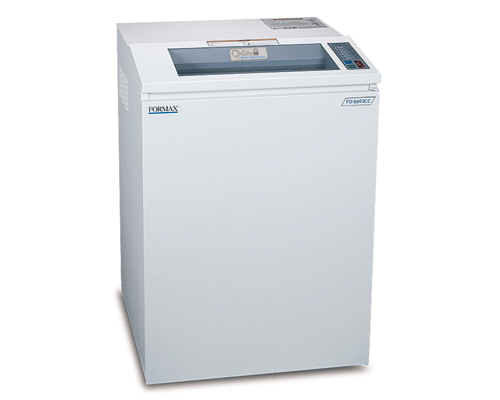 Formax FD 8600CC Cross-Cut Office Paper Shredder has a commercial-grade components in a sleek, office-friendly design. It offers a 16″ feed opening combined with an easy-to-use LED control panel putting the power right at your fingertips, even telling you when the 26 gallon bin is getting close to full. This model can shred up to 28 sheets at a time, up to 20 feet per minute. It rolls on casters, but please remember that it’s not road tested, and it’s plugged into the wall. The FD 8600CC Cross-Cut Office Paper Shredder is $2,367.50 at Lloyd’s. We’ll throw in free shipping and a gift with your purchase. For more information on the FD 8600CC Cross-Cut Office Paper Shredder or to place an order, please visit the Lloyd’s website.